aviate is a loose collective of artists and DJs formed in Ithaca, NY, who create opportunities to showcase new talent by throwing arts and music events in club venues. 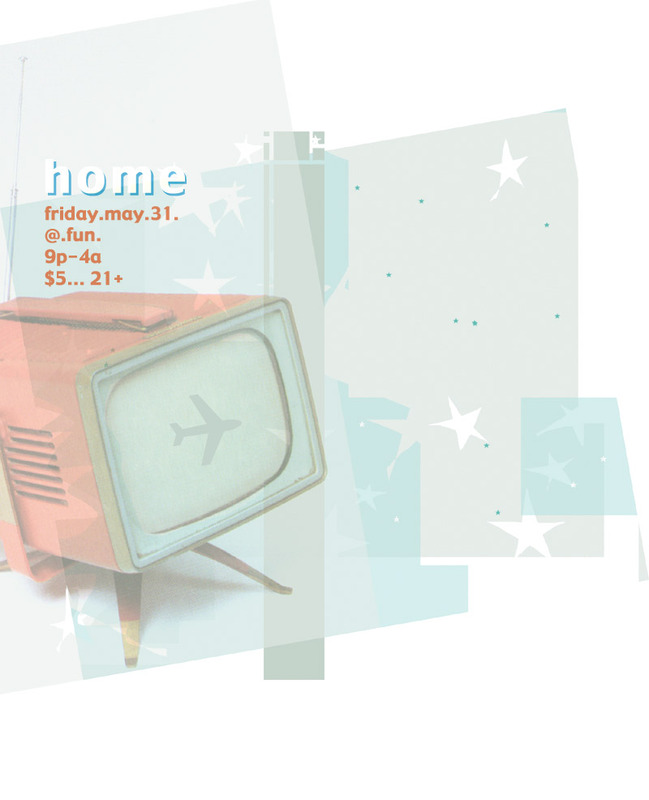 HOME is the first aviate party in NYC, held May 31 at the club FUN (see directions), located in lower Manhattan. HOME features over 50 visual artists who have been asked to base their works on the domestic interior; these works vary from large-scale film/video, sculpture, installations, and photography. Included in the melee will be recipe card memos, fridge drawings, live laminating, futon TV, movies about furniture catalogs, animated cookbook illustrations, baking pan pictures, disposable clothesline souvenirs, and much much more! To view the always evolving list of artists, click here. HOME is also featuring musical acts ranging from live experimental laptop performers to DJs spinning electro, hip hop, breaks, house, and drum n bass. To view the current and always updated list of musical acts, click here.